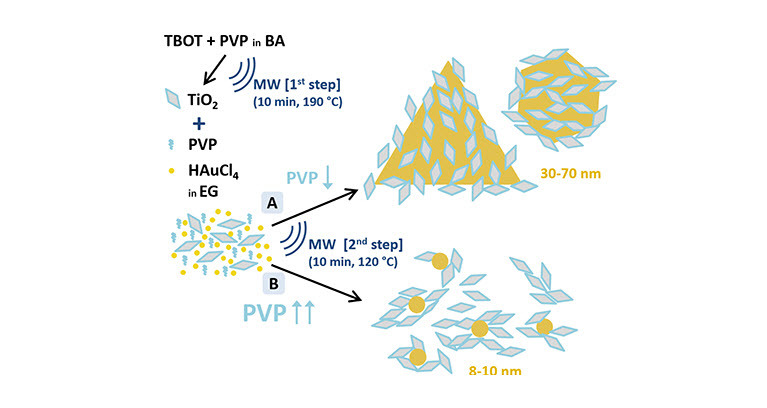 The fabrication of small anatase titanium dioxide (TiO2) nanoparticles (NPs) attached to larger anisotropic gold (Au) morphologies by a very fast and simple two-step microwave-assisted synthesis is presented. The TiO2/Au NPs are synthesized using polyvinylpyrrolidone (PVP) as reducing, capping and stabilizing agent through a polyol approach. To optimize the contact between the titania and the gold and facilitate electron transfer, the PVP is removed by calcination at mild temperatures. The nanocatalysts activity is then evaluated in the photocatalytic production of hydrogen from water/ethanol mixtures in gas-phase at ambient temperature. A maximum value 5.3 mmol/(g(cat)·h) (7.4 mmol/(g(TiO2)·h) of hydrogen is recorded for the system with larger gold particles at an optimum calcination temperature of 450°C. Herein we demonstrate that TiO2-based photocatalysts with high Au loading and large Au particle size (≈50 nm) NPs have photocatalytic activity.